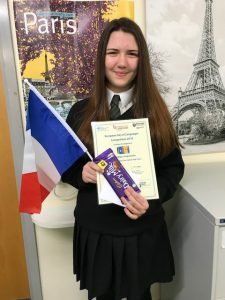 Year 10 pupil Amy was one of just two students nationally to be Highly Commended in the Association for Language Learning (ALL) national writing competition. In September, the whole school was invited to participate in the annual celebrations for the European Day of Languages. Opportunities were varied and included ‘The Great Holy Cross Bake Off’, the MFL food tasting table and the tutor group challenge. During lessons, all pupils at KS3 and GCSE MFL pupils at KS4 were encouraged to enter a national writing competition run by the ALL. The theme of the competition was entitled ‘A recipe for happiness’ and pupils were asked to write a short passage in a foreign language about their thoughts and interpretation of this title. The MFL department was impressed with the pupils’ creativity and efforts and more than 300 entries were sent off in a variety of foreign languages, including French, German, Spanish, Gaelic, Polish, Punjabi and Filipino. This is just the second year Holy Cross has submitted entries to this competition and we were hoping for success following Niamh Rooney’s highly commended entry in Autumn 2017. The 2018 results have just been published and the judges commended Holy Cross, just one of five schools nationally commended, on the number of entries received and praised three Year Eight pupils in particular for their work. They were Jacob, Daniella and Amelia who received a certificate and chocolate. At KS4, just two highly commended prizes were awarded nationally and one of them was awarded to Amy, who was presented with a certificate, chocolate and a £50 shopping voucher.